Who Writes the Britannica Articles? How does an article make its way from concept to publication? Who actually writes the articles? Why is Britannica so trusted? The following infographic explains it all through a behind-the-scenes look at our rigorous publishing process. 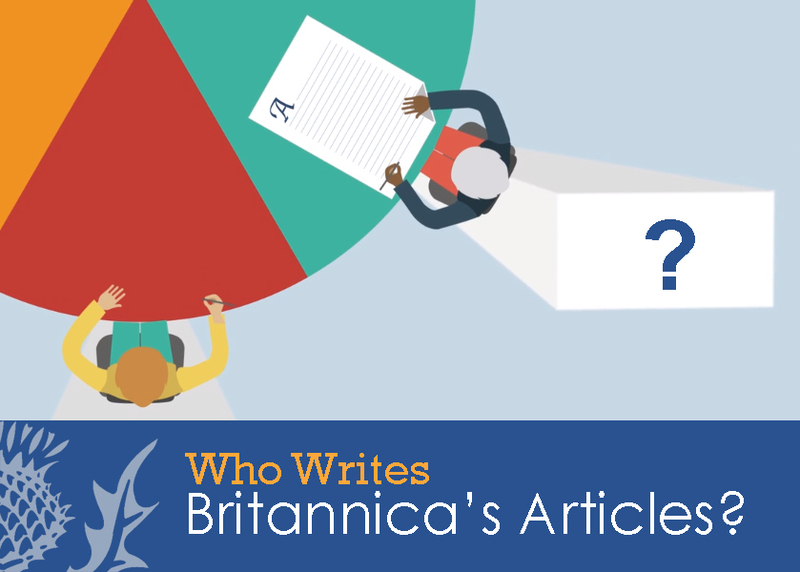 Over the course of more than 200 years, Britannica has developed a thorough and meticulous editorial system to deliver the most trusted information worldwide. As a result, students and educators across the globe have unparalleled access to expert knowledge in all subject areas, all aligned to today’s curriculum. Introducing young minds to the diverse histories and cultures of the world? Trust the Australian Aboriginal peoples article co-written by Ronald M. Berndt, Foundation Professor of Anthropology at University of Western Australia and foundation member of the Australian Institute of Aboriginal Studies, and Robert Tonkinson, Emeritus Professor of Anthropology at University of Western Australia and editor of The Wentworth Lectures: Honouring Fifty Years of Australian Indigenous Studies. Find expert guidance through the rich tapestry of Chinese literature in the article co-authored by Tien-yi Li, Mershon, Professor Emeritus of Chinese Literature and History at Ohio State University or gain a new perspective on Elizabethan politics and being a female ruler in a patriarchal world with John S. Morrill, Assistant Master and Professor of History at the University of Cambridge, and co-contributor to Elizabeth I. The refugee article by Britannica editors offers a concise introduction to a complex subject, while researchers looking for geopolitical background on North Korea can trust the article co-penned by regional expert Professor Woo-ik Yu, Professor of Geography at Seoul National University, former South Korean ambassador to China and South Korean Minister of Unification. Explore the nature and function of cells, with contributions from Harvey F. Lodish, former Professor of Biology at Massachusetts Institute of Technology and co author of Molecular Cell Biology; Study the theory of evolution, written by Francisco Jose Ayala, Professor of Biological Science at University of California, Irvine and awardee of the 2001 Templeton Prize; Or expand your astrophysics know-how with dark matter by Nobel laureate and discoverer of dark energy, Professor Adam Riess. Browsing areas of interest for some casual reading? The best and brightest minds in the world—4,500 and counting—provide the articles that make up one of the most-trusted and up-to-date information resources anywhere. Add to that expertise from an editorial team that is 100+ members strong, with copy editors, fact-checkers, and even children’s editors that revise original articles to make them reading-level appropriate. How does all of this brain power fit into today’s schools and libraries? As we teach students how to conduct effective research, the ability to objectively evaluate sources for credibility and accuracy before using them is critical. Many students simply accept the legitimacy of the online sources they find, instead of scrutinising the quality and accuracy that 21st-century information literacy demands. Britannica’s role is to provide easy access to the clarity and quality that students are looking for and that educators require.